A disgraced and somewhat humbled former U.S. president and a slightly haughty-seeming British TV journalist are the title characters in Frost/Nixon, a film about one of the most dramatic TV interviews in recent American history Two powerful men (and their teams of representatives and aides) joust for advantage before the cameras roll on the hours-long interview that resulted from the interview, the first for Richard Nixon since leaving the White House in disgrace as he proclaimed “I am not a criminal” to the press corps but refusing to discuss his role in the crimes of the Watergate scandal. The time of Frost/Nixon is 1977. Politically, much of America has moved on, with an outsider Democrat, President Carter, in the White House and a few years under the bridge to forget about the travails of Watergate. The former president who quit rather than face impeachment proceedings, Richard Milhous Nixon, was ready to talk about what had happened when he was president and his underlings were caught in crimes ranging from burglary to perjury and more. Nixon chose British journalist David Frost to be his official interviewer, revealing calculated political thinking that had always been Nixon’s way. Nixon, of course, did not exactly have a reputation of being the most TV-friendly president (see: his disastrous 1960 TV debate). But this time he was going to at least nail the hair and makeup part. Frost may have been seen as something of a TV news lightweight, but he leaned into his role and resolved to take on the cagey former president head-to-head, with cameras rolling. Negotiations ensued over details that were hashed out as if it were to be a major international summit. Questions of where the interview would take place, time and date and duration, and of course, the fee to be paid to the out-of-work politician that ultimately topped out at a heft $600,000 in 1977 value. Not a bad retirement haul for a government worker who may have lost his pension. Director Ron Howard and writer Peter Morgan (adapting his own stage play) develop the characters and the tension that builds over the weeks of preparation, ultimately climaxing in the days of live questioning that ends up being a six-hour televised interview in real life. Both men lead teams of underlings who bicker and question whether the result will be worth the effort. Each shows his character flaws and strengths as behind the scenes relationships let the viewer into the world of high-stakes tension that is entertainment and politics, both. Highlighting the struggles and conflicts of the two lead characters, the movie shows a cagey politician ultimately backed into the corner of reality by a dogged interviewer who will not stop asking questions until he hears some sort of acknowledgement of a culpable role in one of America’s most captivating political dramas. And ultimately, Nixon felt that he gave America what it deserved; maybe not an apology, but a statement, an acceptance of a sort, for some responsibility for things that may have gone wrong. The Interview is a movie released in 2014. It features Dave Skylark with hi produce known as Aaron Rapoport. They run a celebrity tabloid TV show that is known as the Skylark Tonight. They discover that the dictator in the North Korea Empire called Kin Jong-un is a great fan of that show. This is what changes the movement of the entire movie. This is, therefore, an opportunity to interview him that they see and they want to legitimize themselves as journalists. There is a sudden change of plans that happens just before they leave. The CIA recruits them and changes the entire idea. They are hired to assassinate the dictator. It is an intelligent thriller which becomes an engrossing experience. Throughout the entire movie, there is a lot of dialogue in place. The use of words as well and choosy. A lot of long pauses, as well as the dead space, is part of the dialogue. It is one way that is used in creating attention throughout the entire movie. Any film review calls for an assessment of the movies aesthetics, social and also the cultural merits. Any movie review is written in very brief statements that are very direct to the point. The review is mainly to tell the reader whether the movie is worth to read or whether it is not worth. It helps the reader to have a prior update on what to expect in the movie. They are also able to have a prior knowledge of what gets to happen in the movie. With the synopsis, they can as well judge how good the movie will be. The Interview as was released by Sony faced so many challenged. It was to be banned but was able to get to the eyes of the viewers. It actually became Sony’s biggest digital release. Due to the many challenges, they were forced to avail the movie through the online rentals and purchases. The Interview, despite the challenges, was able to bring in more than $40 million. It was as well able to ringing more than $11 million through the box office. The movies reviews beings along great insight. 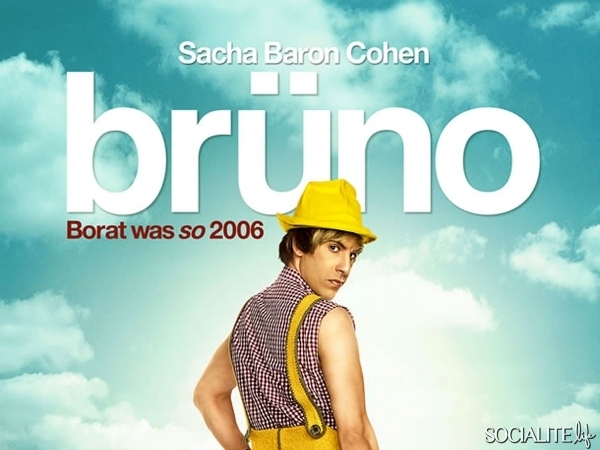 Sacha Baron Cohen stars as Brüno in the titular film. Larry Charles was assigned as Director for the film as well. The film was shot using a budget of just $42 million at the time. That was an impressive number and represented the dedication of the film team. Sacha Baron Cohen was interviewed during the film to understand his role in time. Brüno is a comedy and has surprised many with its comical tone as well. It pushed the boundaries, but ultimately proved to be a resounding success. The film encouraged a lot of conversation about sexuality in the world. Fans always appreciate Sacha Baron Cohen and his brand of humor. Brüno was just the latest film in a long line of his projects. The actor has made these characters accessible and humorous to a lot of people in the world. Brüno proved to be popular as soon as it was released. Legions of fans went to theaters to see the comedy when it was released. The official release date was July 10, 2009 and fans seemed to be captivated by that too. Brüno was widely viewed in the United States and the United Kingdom. Fans in these countries wanted to see the film when it was aired. Jokes about Osama bin Laden and other controversial topics were spoken during the film. Brüno also appears to be a gay character and approaches some taboo subjects for many. Sacha Baron Cohen definitely pushed the boundaries and wanted to evoke a lot of emotion from audiences. That proved to be an important selling point for Brüno and explains the success of the film. Fans have followed the release and have great things to say about it too. Humor about the Middle East is a big selling point for that film as well. The success of Brüno can be seen in numerous ways over time. Critics seem to appreciate the music and acting performances that are seen in the film. That resulted in a lot of positive praise for the film and other important details. Several interview features were spawned as a result of the film itself. Brüno proved to be a popular movie and fans went to the theater to see it on screen. The box office return was listed as $138.8 million after some time. That proved that the film was also a financial success. The producers were able to double the money spent in making Brüno. Erran Baron Cohen was the music producer for the film as it was aired. Brüno took a collaboration from a lot of creative people who were involved with the film. The character undergoes a lot of changes in the film and even becomes a heterosexual. There are plenty of innuendos and other faux pas jokes to be seen in the movie. Brüno sparked conversation about gender and sexuality for a lot of film viewers. That proves to be an important consideration that fans have discussed in good time.